See bottom of post for video. This post is a continuation of our two-part series on how to prepare two of the most important Title V reports. 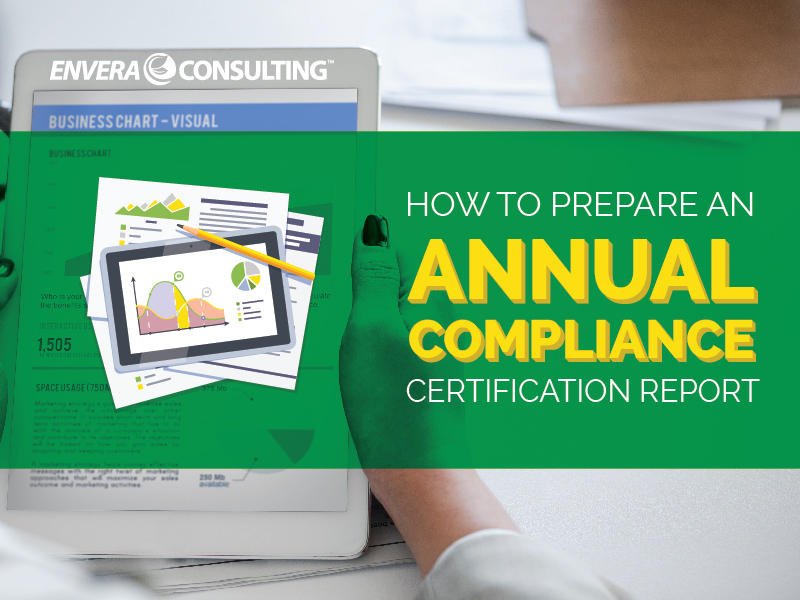 In our previous post, we discussed how to prepare a semi-annual monitoring (SAM) report, one of the two most common — and important — reports required by Title V. Today, we’re going to focus on the second, the annual compliance certification (ACC) report. The annual compliance certification (ACC) is simply a certification that the facility has operated in compliance with all the terms and conditions of the permit. Continous compliance. From day one to day 180, the facility was always in compliance. If you didn’t have any deviations, excess emissions, breakdowns, or emergencies during the reporting period, it’s generally safe to say that compliance was continuous. Intermittent compliance. The difference between continuous and intermittent compliance is one of those gray areas so common in environmental compliance, so make sure you review the data with any and all stakeholders. In the purely Boolean sense (i.e., yes or no? ), if your facility is not in continuous compliance, it is in intermittent compliance. That means that if you experienced any deviations, breakdowns, emergencies, or excess emissions during that 180-day reporting period, your compliance was intermittent. Intermittent compliance almost always comes with a number of follow-up questions: What are the instances of non-compliance? How long has the facility been non-compliant? When a non-compliance issue arises, the first thing you should do is talk to your management team — and possibly even your legal team. At Envera, we see an ACC report as simply combining two semi-annual reports. When you prepare an ACC, you look at the two most recent SAM reports to determine whether the facility was in continuous or intermittent compliance. Then you certify accordingly. Step 1: Verify that all equipment in the field is listed on your permit. Bring your Title V permit into the field and go down the permit list to verify that all of the equipment that’s on your permit is in the field, as well as that all the equipment is accurately described on your permit. Step 2: Determine if the facility is in compliance with the conditions of the permit. To do this, review all records on the previous two SAM reports to determine if the facility complied with all the terms and conditions associated with the permit. Step 3: Determine if compliance was continuous or intermittent. Depending on what you find in the previous step, determine whether compliance was continuous or intermittent (which usually should be done in conjunction with your management team) and then complete SCAQMD Form 500-ACC. Note that simply disclosing non-compliance to the regulatory agency — either in the SAM or the ACC —doesn’t protect the facility from enforcement. The agency can take an enforcement action after receiving that report, so be careful. In fact, if you submit an ACC stating that your facility has intermittent compliance, you can be rather certain that the agency will issue a Title V violation for non-compliance. Of course, this depends on the instances of non-compliance, the nature of the deviations, and on how you addressed these instances. When it comes to Title V, compliance must be at a forefront. You need to have a very robust internal system to manage instances of non-compliance because, under Title V, you are required to report all such instances. Too many instances of non-compliance can turn into an unpleasant — and even costly — situation. Step 4: Prepare and submit the ACC report. Submit the ACC to both the EPA and the SCAQMD. The due dates follow the schedule of the RECLAIM annual reports. If you’re a Title V non-RECLAIM facility or a Title V RECLAIM Cycle 1, your ACC report is due on February 28. If you are Title V and RECLAIM Cycle 2, then your ACC report is due on August 30. A Cycle 1 facility is simply one whose RECLAIM compliance year follows a calendar year (January to December). A Cycle 2 facility compliance year is July to June. So know your due date! We’ve seen quite a few notices of violation issued simply because a facility’s reports were submitted during the wrong cycle. That’s a simple mistake that’s easily avoided.